Mike Spoor, left, discusses the riverbank stabilization project with Congressman Bill Johnson on Monday afternoon. Captain Nolan Love, middle, talks with Congressman Bill Johnson, right, about the riverbank stabilization project. 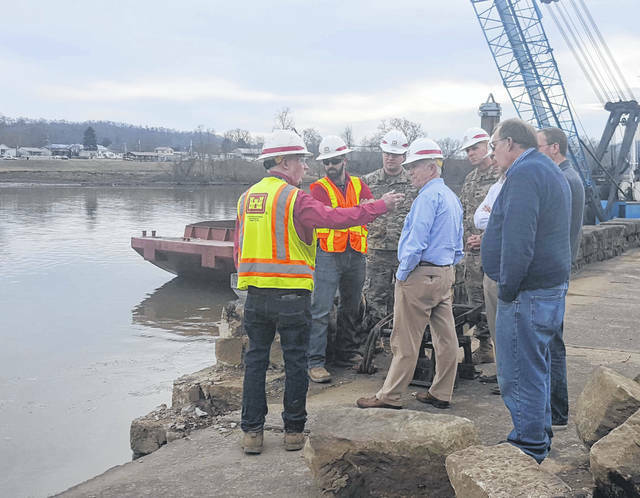 Pomeroy Village officials and U.S. Army Corps of Engineers representatives met with Congressman Bill Johnson on Monday afternoon. Rock has begun being placed in front of the parking lot wall as part of the riverbank stabilization project. 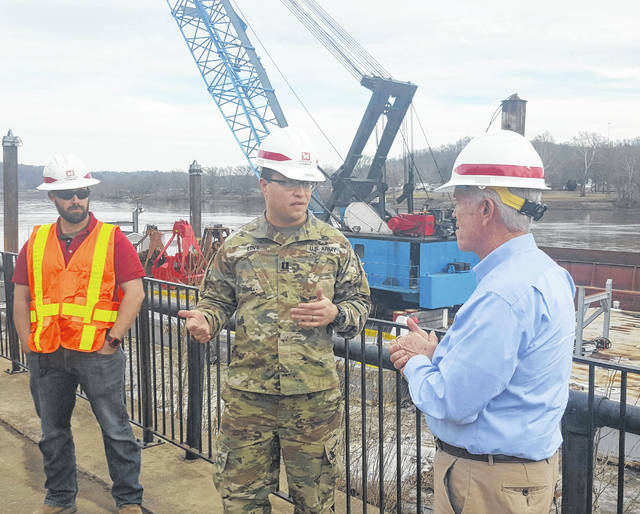 U.S. Army Corps of Engineers representatives discussed the riverbank stabilization project with Congressman Bill Johnson and village officials on Monday. 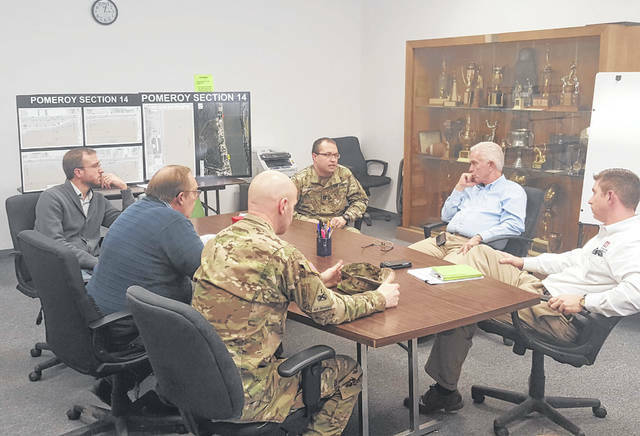 POMEROY — Representatives from the U.S. Army Corps of Engineers Huntington District and the Village of Pomeroy met with Congressman Bill Johnson on Monday afternoon, discussing the riverbank stabilization project currently taking place in the village. At this time, work is happening on the base project which includes the upper parking lot area and the riverbank area across from Francis Florist. Funding is also secured for what is called option one, which is the riverbank in the area of village hall. Work is taking place and is on schedule Mike Spoor, who has been with the Corps of Engineers 55 years, told those in attendance at the meeting. 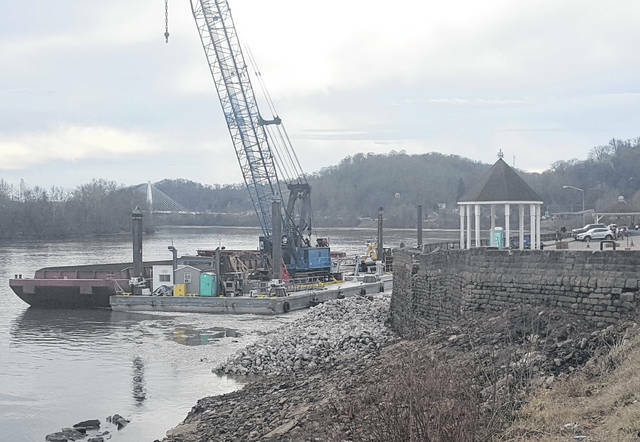 Pomeroy Mayor Don Anderson asked about the possibility of the construction crews working on the weekends if weather permits, which Spoor stated could be a possibility in order to meet the completion date. Capt. Nolan Love, who is the project manager, estimated that the base project could be completed in late April with the overall work to be done around August for the base project and both options. Capt. Love advised that option two is not as urgent a matter as the base project and option one, but that the area would need action taken in tow to four years if not completed now. Option two is currently where the delay could be for the project. As of right now, the real estate has not been secured for the project as the owner of the property is unknown. Anderson stated that the village solicitor has been working to research the property, but that it is a lengthy process. Congressman Johnson asked about the possibility of speeding up the process and what could be done to help with the acquisition of the property. Johnson asked to have a call with the solicitor at a future time to see what he and his office could do to help. In addition to the real estate concerns, there is the issue of funding for the additional area. Since the project estimates were set and the grant funding secured additional damage has been done to the riverbank from the flooding and high water in 2018 which resulted in changes to the amount of rock needed for the project. The additional rock added to the cost of the project. While the Corps of Engineers has been able to secure the needed federal funding for option two, which is the area near Fox’s Pizza, the village will need an additional $140,000 by the end of May for their match on the project. This is in addition to the $623,000 in grant funding and a $50,000 loan which the village has taken out. By federal law, stated Capt. Love, the village must have a 35 percent match of funds for the project. The match can come from grants or other non-federal funding. Johnson asked about the possibility of additional grant funding, but Anderson stated that the timing of the funding would not match up with the end of May deadline under the current project contract. If the project were to go beyond that date then there is the risk of increased cost of having to rebid the contract. Anderson stated that Buckeye Hills, which has been assisting with the project, would not know about possible funding until closer to the end of the fiscal year in late September. Anderson told Johnson that the village cannot afford to take out a loan for the amount unless the grant funding is in place to reimburse it. Johnson asked his local representative Juli Stephens to set up a meeting with all of the possible grant funding agencies, as well as State Rep. Jay Edwards and State Senator Frank Hoagland to discuss the possibility of finding the needed funding. Anderson stated that Edwards is aware of the situation and has been exploring funding options. “There has to be somewhere we can find $200,000,” said Johnson. Johnson stated that if the entire project was not completed now then there would be the danger of having to start over with the federal funding and getting on the priority list once again. The Congressman also expressed concern that if the work was not done now, and the road were to become damaged, what the impact could be to the village of Pomeroy. 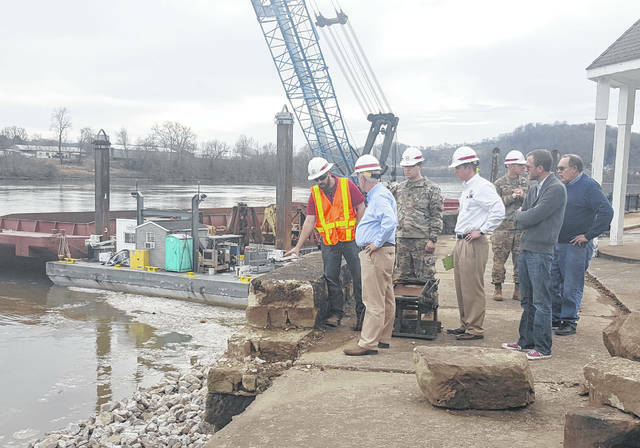 https://www.mydailysentinel.com/wp-content/uploads/sites/14/2019/02/web1_2.5-Johnson-1_ne20192417515520.jpgMike Spoor, left, discusses the riverbank stabilization project with Congressman Bill Johnson on Monday afternoon. https://www.mydailysentinel.com/wp-content/uploads/sites/14/2019/02/web1_2.5-Johnson-2_ne2019241751820.jpgCaptain Nolan Love, middle, talks with Congressman Bill Johnson, right, about the riverbank stabilization project. https://www.mydailysentinel.com/wp-content/uploads/sites/14/2019/02/web1_2.5-Johnson-3_ne20192417521915.jpgPomeroy Village officials and U.S. Army Corps of Engineers representatives met with Congressman Bill Johnson on Monday afternoon. https://www.mydailysentinel.com/wp-content/uploads/sites/14/2019/02/web1_2.5-Johnson-4_ne20192417524951.jpgRock has begun being placed in front of the parking lot wall as part of the riverbank stabilization project. https://www.mydailysentinel.com/wp-content/uploads/sites/14/2019/02/web1_2.5-Johnson-5_ne20192417527778.jpgU.S. Army Corps of Engineers representatives discussed the riverbank stabilization project with Congressman Bill Johnson and village officials on Monday.